Author(s): U. Chinna Rajesh, Archana Gupta, Diwan S. Rawat. Department of Chemistry, University of Delhi, Delhi-110007, India. Alkaloids isolated from the amphibian skin have shown interesting biological profiles especially relevant to neurology. The skin of the Ecuadorian frog tricolor has provided as a source for novel quinolizidine alkaloid epiquinamide, albeit in the minute quantities (240 µg from 183 frogs) representing a new class of nicotinic agonists in CNS disorders. Significant efforts have been devoted to the stereoselective synthesis of epiquinamide and its isomers with different strategies since 2005. Till date, about seventeen total syntheses of natural epiquinamide and its isomers have been published. This review aims to analyze the advances in the developed strategies and methodologies for stereoselective total syntheses of target molecule epiquinamide and its isomers. Keywords: 1-hydroxyquinolizidinone, curtius rearrangement, ecuadorian frog, epiquinamide, Grignard reaction, quinolizidine alkaloid, radical cyclization, ring closing metathesis, sharpless asymmetric dihydroxylation, total synthesis. Affiliation:Department of Chemistry, University of Delhi, Delhi-110007, India. Keywords:1-hydroxyquinolizidinone, curtius rearrangement, ecuadorian frog, epiquinamide, Grignard reaction, quinolizidine alkaloid, radical cyclization, ring closing metathesis, sharpless asymmetric dihydroxylation, total synthesis. Abstract:Alkaloids isolated from the amphibian skin have shown interesting biological profiles especially relevant to neurology. 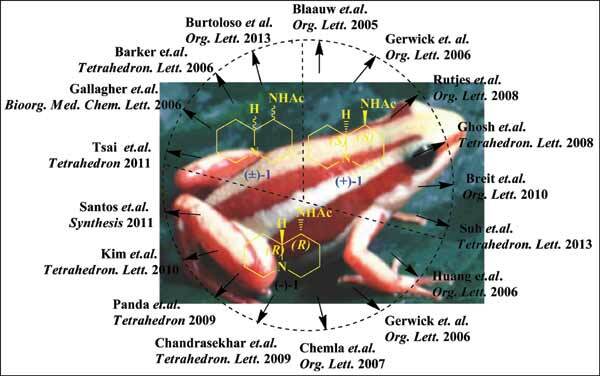 The skin of the Ecuadorian frog tricolor has provided as a source for novel quinolizidine alkaloid epiquinamide, albeit in the minute quantities (240 µg from 183 frogs) representing a new class of nicotinic agonists in CNS disorders. Significant efforts have been devoted to the stereoselective synthesis of epiquinamide and its isomers with different strategies since 2005. Till date, about seventeen total syntheses of natural epiquinamide and its isomers have been published. This review aims to analyze the advances in the developed strategies and methodologies for stereoselective total syntheses of target molecule epiquinamide and its isomers.